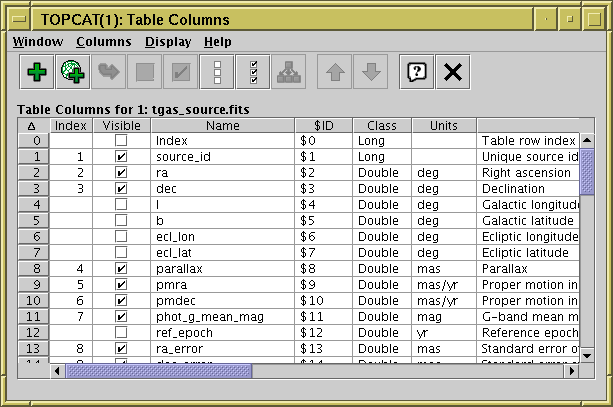 The Columns Window displays a JTable giving all the information (metadata) known about each column in the table. You can display it using the Column Info ( ) button when the chosen table is selected in the Control Window's Table List. The display may take a little bit of getting used to, since each column in the main data table is represented by a row in the JTable displayed here. The order and widths of the columns of the JTable widget can be changed in the same way as those for the Data Window JTable, but this has no effect on the data. The column on the left labelled Visible contains a checkbox in each row (one for each column of the data table). Initially, these are all ticked. By clicking on those boxes, you can toggle them between ticked and unticked. When unticked, the column in question will become hidden. The row can still be seen in this window, but the corresponding data column is no longer a part of the Apparent Table, so will not be seen in the Data Window or appear in exported versions of the table. You can tick/untick multiple columns at once by highlighting a set of rows by dragging the mouse over them and then using the Hide Selected ( ) or Reveal Selected ( ) toolbar buttons or menu items. If you want to hide or reveal all the columns in the table, use the Hide All ( ) or Reveal All ( ) buttons. The index of the column in the current Column Set. The column with value "1" here will be the leftmost one in the Data window etc. This value is blank for hidden columns. Sorting on this column (by clicking its header) will show all the visible table columns in order at the top of the display. Indicates whether the column is part of the Apparent Table. If this box is not filled in, then for most purposes the column will be hidden from display. You can toggle visibility by clicking on this column. A unique and unchanging ID value for each column. These are useful in defining algebraic expressions (see Section 7) since they are guaranteed unique for each column. Although the column Name can be used as well, the Name may not be unique and may not have the correct form for use in an algebraic expression. The Java class of the items in that column. You don't have to know very much Java to understand these; they are Float or Double for floating point numbers; Byte, Short, Integer or Long for integer numbers, Boolean for a logical (true/false) flag, or String for a string of ASCII or Unicode characters. There are other possibilities, but these will cover most. The characters '' after the name of the class indicates that each cell in the column holds an array of the indicated type. Cells of a table can contain arrays as well as scalars. If the column contains an array type, this indicates the shape that it should be interpreted as. It gives the dimensions in column-major order. The last element may be a '*' to indicate that the size of the array may be variable. For scalar columns, this item will be blank. The units in which quantities in this column are expressed. The algebraic expression defining the values in this column. This will only be filled in if the column in question is a synthetic column which you have added, rather than one present in the data in their original loaded form. A textual description of the function of this column. The UCD associated with this column, if one is specified. UCDs are Uniform Content Descriptors, and indicate the semantics of the values in this column. If the string in the UCD column is the identifier of a known UCD, the standard description associated with that UCD is shown here. There may be other items in the list specific to the table in question. You can edit column names and some other entries in this JTable by double-clicking on them as usual. By default, the order in which the rows are displayed is determined by the table's current Column Set. However, you can change the display order in this window by clicking on the column headers (in the same way as for some other JTables). The little up arrow at the top left of the scrolled JTable display indicates that the display is in its "natural" (Column Set) order, but by clicking on headers you can sort by column name, units UCD etc. Clicking sorts up, clicking again sorts down, and a third time (or clicking on the top left) restores natural order. You can change the order of the columns in the Column Set by dragging the grey number cell at the left of the corresponding row up or down. Note however this is only possible for non-hidden columns, and it only works if this JTable is currently displayed either in its natural order or sorted by the Index column (see above) - dragging rows wouldn't have any effect if some other sort order was active. An alternative way to change Column Set order is to drag the column headers left or right in the Data Window. A good way to find a column in the Data window if your table is too wide to do it by browsing is to sort the table in this window on some suitable item (e.g. Name, Units, UCD), scroll to the column of interest, and then click on it; that causes the view in the Data Window to scroll sideways so that the selected column is visible. This pops up a Synthetic Column Window which allows you to define a new column in terms of the existing ones by writing an algebraic expression. The new column will be added by default after the last selected column, or at the end if none is selected. This pops up a Sky Coordinates Window which allows you to define a pair of new sky coordinate columns based on an existing pair of sky coordinate columns. If a single column is selected, then clicking this button will pop up a Synthetic Column dialogue to replace the selected column with a new synthetic one. The dialogue is initialised with the same name, units etc as the selected column, and with an expression that evaluates to its value. You can alter any of these, and the new column will replace the old one, which will be hidden and renamed by appending a suffix like "_old" to its name. If any of the columns are selected, then clicking this button will hide them, that is, remove them from the current Column Set. This has the same effect as deselecting all the checkboxes corresponding to these columns in the Visible column. If any of the columns are selected, then clicking this button will make sure they are visible, that is, that they appear in the current Column Set. This has the same effect as selecting all the checkboxes corresponding to these columns in the Visible column. Clicking this button will hide all the columns in the table; the table will have no columns visible in it following this. If you just want to see a few columns, it may be convenient to use this button and then select a few visible ones individually to reveal. Clicking this button will ensure that all the table's columns are visible (none are hidden). If a column is selected which has an array type, clicking this button will replace it with scalar-valued columns containing each of its elements. For instance if a column PMAG contains a 5-element vector of type float representing magnitudes in 5 different bands, then selecting it and hitting this button will hide PMAG and insert 5 new Float-type columns PMAG_1...PMAG_5 in its place each containing one of the magnitudes. If a single column is selected then the table's current Sort Order will be set to sort ascending on that column. Otherwise this action is not available. If a single column is selected then the table's current Sort Order will be set to sort descending on that column. Otherwise this action is not available. Several of these actions operate on the currently selected column or columns. You can select columns by clicking on the corresponding row in the displayed JTable as usual. A side effect of selecting a single column is that the table view in the Data Window will be scrolled sideways so that the selected column is visible in (approximately) the middle of the screen. This can be a boon if you are dealing with a table that contains a large number of columns.